Divided infringement occurs when no one party actually performs all of the steps of a patent claim. For example, one party performs some of the steps and another party performs the remaining steps. One way to solve this problem is to draft patent claims such that one party will likely perform all of the claimed steps. However sometimes its not easy to do so given the prior art. Take David Tropp’s patent no. 7,021,537 for example. That patent is directed to a method of improving airline luggage inspection through he use of dual access locks. 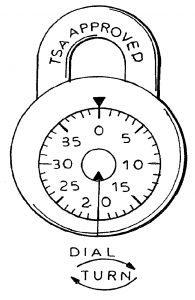 Claim 1 of the ‘537 patent provides the following general steps (a) providing locks to customers that have two means of opening: a combination lock portion and a master key lock portion, and (b) using the master key to open the lock during luggage screening. In the case of Travel Sentry Inc. v. Tropp, No. 2016-2386 (Fed Cir. 2017), Travel Sentry provided on behalf of itself or through licensees the locks according to step (a). But the TSA performs step (b). The question is whether the TSA’s acts of opening the locks with a master key are attributable to Travel Sentry, such that Travel Sentry is liable for infringement. The court found that a reasonable jury could answer that question in the affirmative. I suspect that there was probably prior art showing locks having to means of opening so that Tropp needed the claimed method to include the step of opening the locks during luggage screening to have a novel method over the prior art and obtain the patent. The court found that a reasonable jury could find that TSA receives a benefit from being able to identify Travel Sentry-marked luggage and, where necessary, open that luggage using passkeys that Travel Sentry provided. Ideally, patent claims are drafted such that one party will perform all the steps. When that is not the case, however, the Travel Sensory case clarifies and likely expands the circumstances where it is possible to show that the acts of another are attributable to the defendant so that the defendant can be charged with all steps of the claimed method.